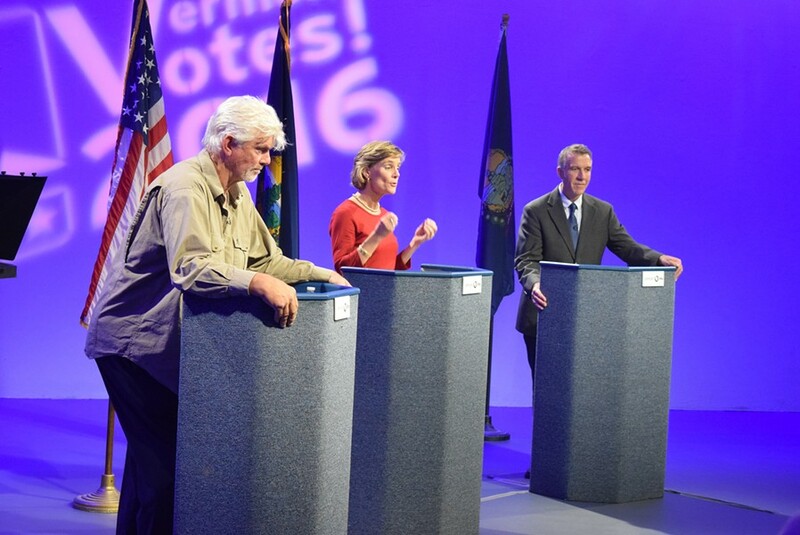 Gubernatorial candidates debate at Vermont PBS on Thursday night. From left: Liberty Union candidate Bill Lee, Democrat Sue Minter and Republican Phil Scott. Democratic gubernatorial candidate Sue Minter accused Republican opponent Phil Scott of failing to understand energy policy and favoring tax breaks for the wealthy. Scott accused Minter of supporting a costly carbon tax, planning to expand the sales taxes to services and pretending college can be free. Liberty Union candidate Bill Lee referred to trickle-down economics as a prostate disease. 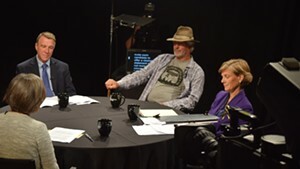 In a 90-minute debate on Vermont PBS television Thursday night, the three candidates sought to distinguish themselves with a month to go before the election. As they have throughout the general election campaign, Minter and Scott revealed significant policy differences as moderators Joe Merone and Neal Goswami posed questions. Minter wants to raise the minimum wage to $12.50 by 2018; Scott argues that an improved economy will raise wages. She wants to institute universal background checks on gun sales; he wants no changes to gun laws. The themes were familiar for the candidates. Yet some of their exchanges turned sharper when each characterized the other’s policies. Scott, 58, is the co-owner of an excavation company and has been lieutenant governor for six years and a state senator for 10 years before that. He said he would look for efficiencies in government to balance the budget. “We can’t tax our way out of it,” he said. 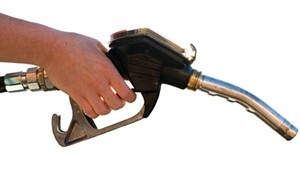 He said that Minter is looking to expand the sales tax on services and supports a carbon tax. Instead, she said, she would look to eliminate loopholes that exempt such items as limousine rides and interest payments on second homes. She said that Scott’s economic policies include expanding tax credits to benefit the wealthy. She said she supports expansion of the Regional Greenhouse Gas Initiative to include transportation fuels. 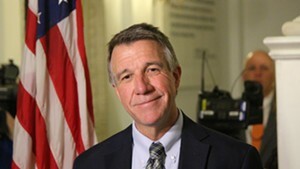 Vermont joined RGGI under Republican governor Jim Douglas’ administration to require electric power companies to purchase allowances for their carbon emissions. Minter sought to link Scott to the conservative billionaire Koch brothers, who have opposed national efforts to combat climate change. The Kochs have contributed to the Republican Governors Association, which is running ads in support of Scott. 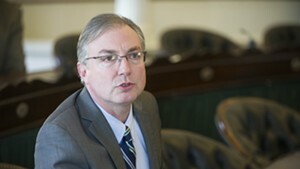 “We cannot let out-of-state oil tycoons buy this election,” Minter said. Scott noted later when an audience member asked him about one of the RGA television ads that he’s legally not allowed to coordinate with the group. The ad features a bobblehead doll of Minter nodding in agreement alongside a bobblehead of her former boss, retiring Democratic governor Peter Shumlin. Scott said he doesn’t like the tone of the ad, noting that he’s never run a negative campaign ad himself. “Whether you’re a man or a woman, I think it rubs you the wrong way,” he said. Scott was more subtle with his attempt to tie Minter to Shumlin, who barely won reelection to his third term two years ago after struggling to establish a health insurance exchange. Scott never used Shumlin’s name as he issued his closing statement, but the message was clear. “It’s essential that we all tell the truth, don’t overpromise and always, always tell the truth,” he said. As she wrapped up, Minter highlighted differences between her and Scott, citing gun control and tax credits.